Horses lend themselves to painting with glazes, or layers of color on top of one another to build up deep, rich colors. This sequence of photos shows how artist Patricia Vaz Dias (Varks on the Painting Forum), who is known for her paintings of horses and dogs, uses watercolor for a portrait of an Arab stallion. When painting a horse in a realistic style, getting the proportions right is crucial. Time spent on getting your initial sketch accurate will save you trouble later. Patricia says: "I start with a sketch in watercolor pencils, using Van Dijck brown for the outlines and bone structures, and sap green for the first careful shading. The lines are all softened up with a wet brush, especially the shadings." 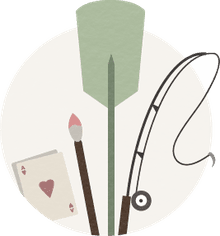 It may feel odd to start with green when horses aren't green, but when you're glazing the initial color you select is chosen for the richness it adds to the ultimate color. Patricia says: "I add more shading in sap green where the darker parts are. Sap green under bright brown colors enhances the depth of the colors. Also some marine green at the tip of the nose. I use marine green because the black skin shows through there and our eyes perceive a more blue shine to black. I add a touch of burnt sienna in the mane just to get a feel of the color. It's a bit too red at this stage and I will need more ochre and green to tone it down some." 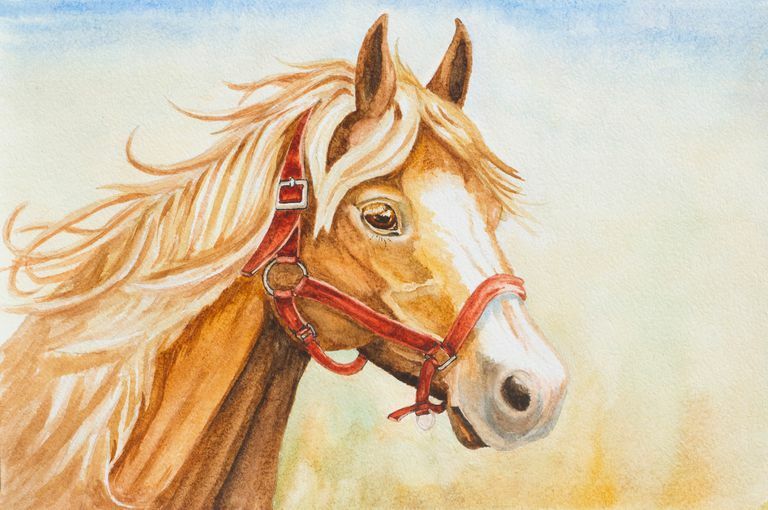 When the initial glaze or wash has dried, which doesn't take long with watercolor, you then gradually add "brown" to create realistic colors on the horse. Patricia says: "I do an overall wash of burnt sienna and yellow ochre. A gentle pink around the nostrils is made of burgundy red mixed with dark indigo blue and yellow ochre. Resist the temptation to paint the details too early on, and get the larger areas working first. Patricia says: "I start filling in the details, such as the dark outline of the eyes and lips, the inner nostril, and an inner ear using a mixture of burnt umber and dark indigo blue. For the eye I use burnt umber with a hint of yellow ochre; I put this in very wet and, after a few seconds of drying, I put a tip of a paper towel in to absorb some paint to get the highlight. While the paint is still wet I put in the pupil with real black. Then I deepen the shadows with burnt sienna and burnt umber. Finally, I calm down the white stripe on the face with some burnt umber and sap green. Knowing when to stop can be the hardest, resisting the temptation to quickly to this and that, which with watercolor can all too easily ruin a painting. Stop sooner rather than later because you can always do a bit more tomorrow, but you can't easily undo something. Patricia says: "Using a mixture of sap and marine green, plus a bit of burnt umber, I paint in the background. The green makes the brown shine. And that's the painting done. Have You Ever Wanted to Paint a Seascape?